The earliest evidence of gardening at Trenarth is the Grade-II listed garden wall which appears to date from the 18th century. Three orchards are also marked on a 19th century estate map - none of which survive - although wild damson and hazel trees can be seen in hedges nearby still. The large pine at the top of the drive is all that remains of an avenue formerly flanking the drive, and a photograph from the 1930s shows a line of cordylines “dripping dracaenas” marching across the lawn in front of the house. This at a time when the walled garden was used as a kitchen garden. After the end of World War II, frames and greenhouses were built in the aforementioned walled garden, and a small nursery garden was run. 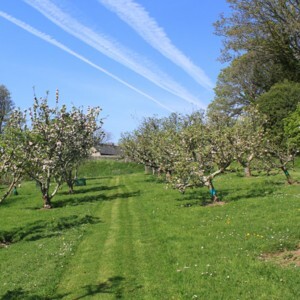 During the 1950s the then owners planted belts and copses for shooting, shelter and ornamental purposes, while the 1960s saw the planting of a new orchard and the yew hedges which form an important part of the walled garden today. Together, these features provide an invaluable backdrop for a garden-in-the-making since 1993. With the exception of a few magnolias, camellias, hydrangeas and the orchard, all of the planting has been done in the last twenty years. 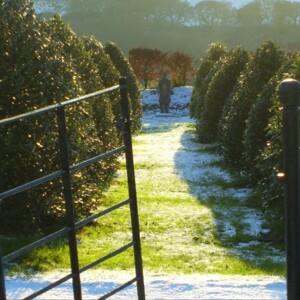 The entrance to the garden is via a drive flanked by camellias, backed by a beech walk, and all under planted with bulbs, hellebores, and varieties of cornus. 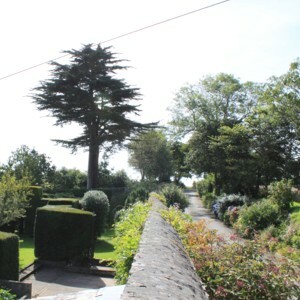 The walled garden contains a refurbished traditional potting shed, prize winning vegetable garden, rockery and herbaceous beds, and a series of yew ‘rooms’. The walls themselves play host to various tender climbers. Below the walled garden is the main lawn with terracing, and a newly constructed water feature sited on a gravel and palm garden. Below this the garden becomes far less formal, with a beautiful holm oak avenue, rhododendron beds, a lower bog garden surrounded by plantings of specimen trees and bamboo, a “woodland Wolery” and a large orchard - complete with mistletoe. To find out more about the origins and development of the house and estate, see the History of Trenarth section. - To provide year-round interest in terms of scent, colour and form - a true “garden for all seasons”. - To plant unusual specimens and push the boundaries of what can be grown, and grown well. - To encourage wildlife into the garden. - To instil a sense of quirkiness - all is not what it seems at first sight! 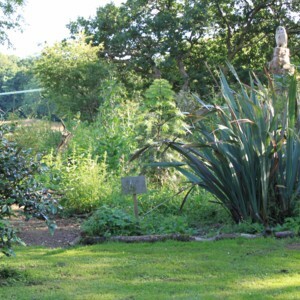 For this year’s opening dates as part of the National Gardens Scheme see the homepage.